Quantum gases - collections of atoms cooled to the lowest known temperatures in the universe, have sparked a revolution in atomic physics. Behaviours, usually only found at the microscopic level, become prominent at the macroscopic level. 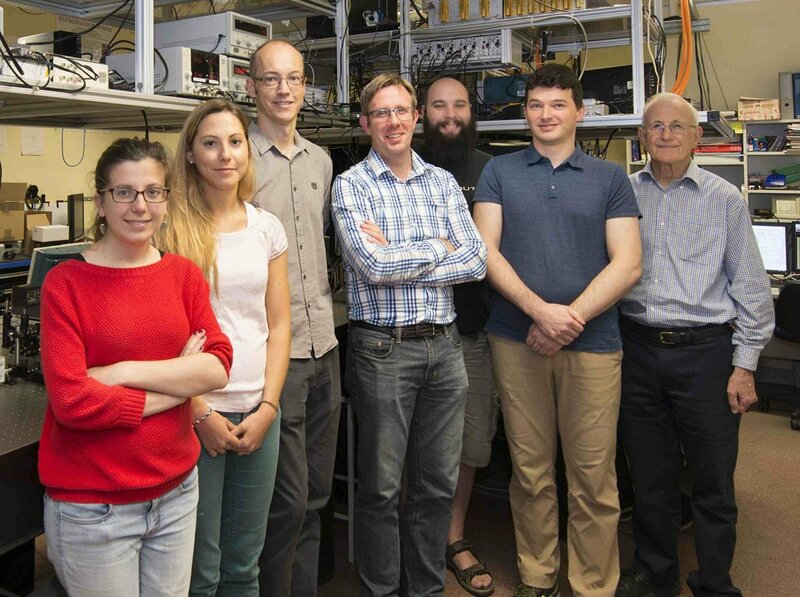 Taking advantage of the precise control and purity available in atomic systems, quantum gases are now being used to address a range of questions in many-body quantum physics. 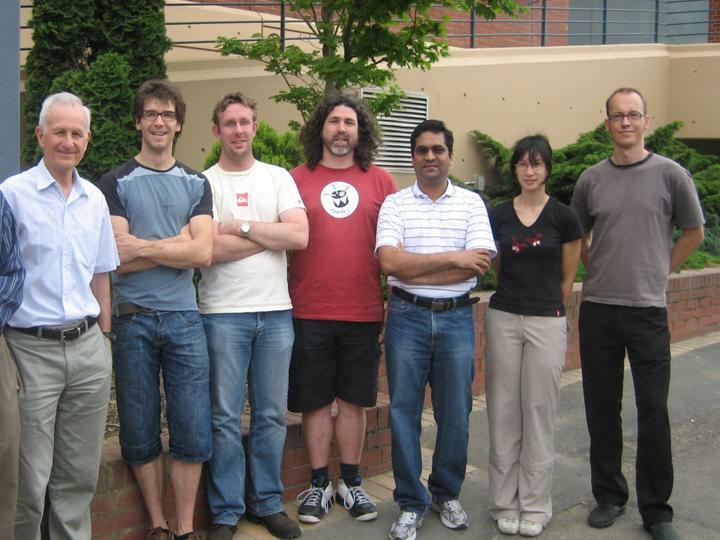 In the ultracold Fermi gas experimental group we use gases of Li-6 atoms, cooled to temperatures below 100nK, to investigate strongly correlated fermions in the crossover from a Bardeen-Cooper-Schrieffer (BCS) superfluid of Cooper pairs to a Bose-Einstein condensate (BEC) of molecules. The ability to control the interparticle interactions using Feshbach resonances, as well as the confining potential and dimensionality of the system, enable us to characterise these Fermi systems with unprecedented accuracy. 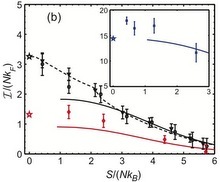 Our recent work has focussed on (i) measuring excitations and universal properties using Bragg spectroscopy, and, (ii) understanding Fermi gases confined to move in two spatial dimensions. 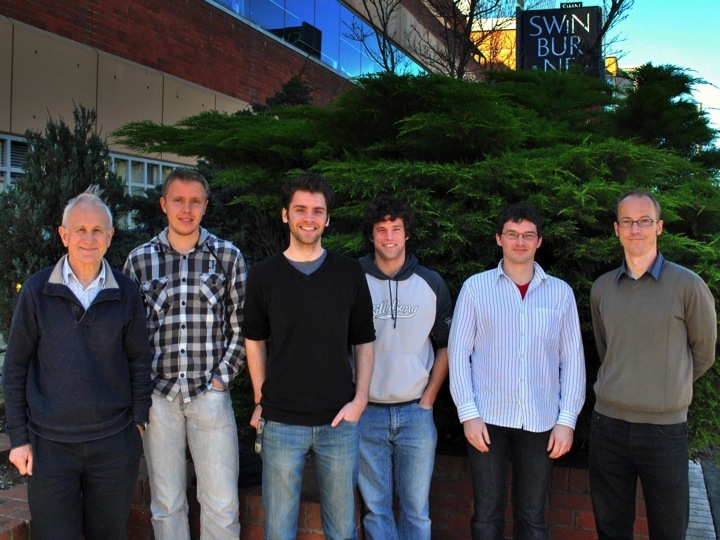 As part of the newly funded ARC Centre of Excellence for Future Low-Energy Electronic Technologies (FLEET) we will test new paradigms for dissipationless transport in topological and non-equilibrium quantum matter synthesised from ultracold atoms. We have mapped out the low-lying excitation spectra of strongly interacting Fermi gases using low-momentum Bragg spectroscopy. Using tightly focussed Bragg beams we directly obtain the speed of sound and pairing gap at near-homogeneous density. We experimentally measure the thermodynamic equation of state of a 2D Fermi gas with tunable interactions. 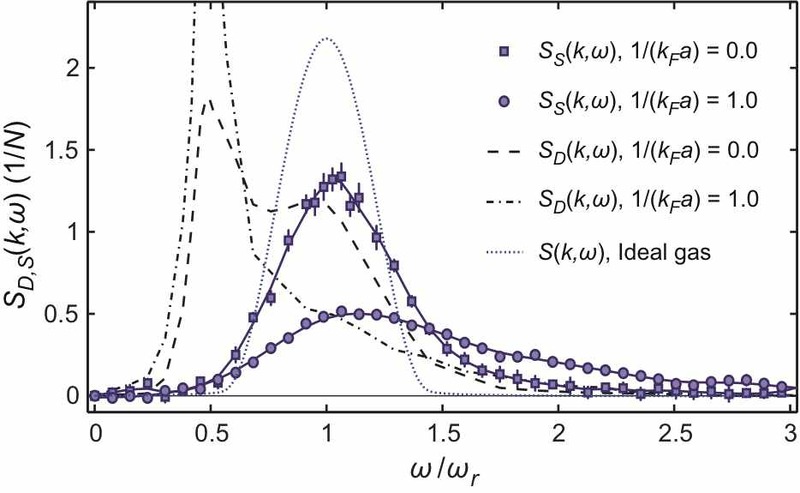 Here we measure how increasing the strength of interactions in a 2D Fermi gas leads to a departure from strict 2D behaviour in regimes where an ideal gas would remain kinematically 2D. This paper reviews experiments with Bragg spectroscopy of two-component Fermi gases. 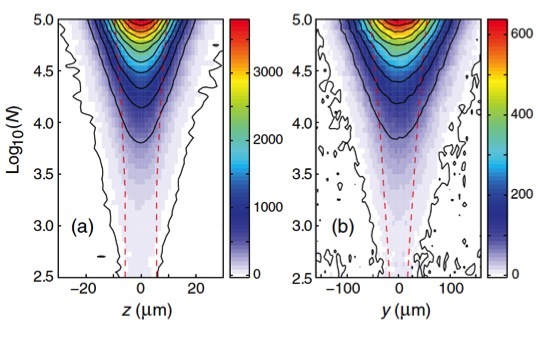 We have developed a technique to obtain local measurements of homogeneous parameters in a harmonically trapped quantum gas and used this to make in situ observations of pair condensation in a unitary Fermi gas. We have made a high precision measurement of Tan's universal contact parameter and compared this with the latest QMC results. Our data have now reached a level of accuracy that allows us to distinguish between several of the established theoretical predictions. A new type of Bragg spectroscopy is presented in which we measure the dynamic spin susceptibility of a strongly interacting Fermi gas. This allows independent measurement of the spin-parallel and spin-antiparallel response functions which become universal at high energy. Here we present a detailed review of the contact in strongly interacting Fermi gases using Bragg spectroscopy. Both the interaction and temperature dependence are studied and two methods for Bragg spectrocscopy are described. 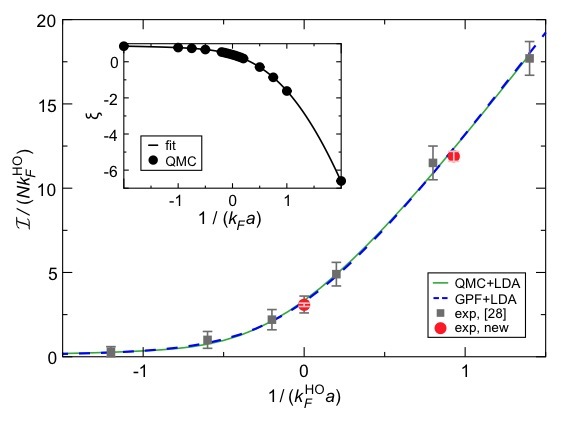 The contact is a recently introduced parameter to characterise universal properties of strongly interacting quantum gases. 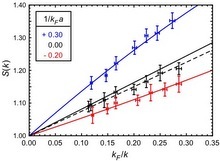 In a Fermi gas, the contact depends on the strength of the interparticle interactions and the temperature relative to the Fermi temperature. 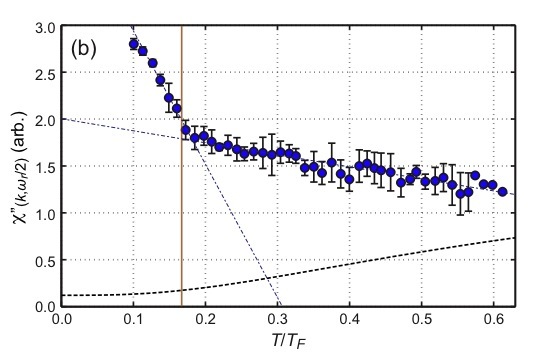 In this paper we present the first measurements of the temperature dependence of the contact in a unitary Fermi gas. A weakly interacting Fermi gas is prepared in an oblate trapping potential to study the 2D-3D dimensional crossover. Shell structure, associated with the filling of discrete transverse states becomes apparent in the density profile of the gas. 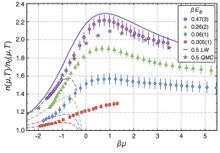 The dynamic structure factor of a strongly interacting Fermi gas was measured and compared to theoretical calculations based on the Random Phase Approximation (RPA). Surprisingly, these show very good agreement with experimental findings. 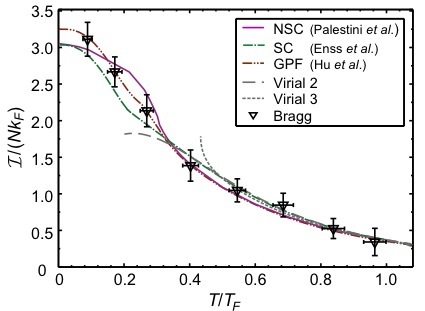 Pairing in strongly interacting Fermi gases is shown to follow Tan's universal law and is verified through the measurement of the static structure factor using Bragg spectroscopy. 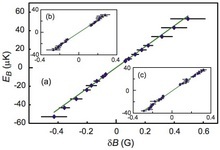 We have performed a comprehensive study of the Bose-Einstein condensate to Bardeen-Cooper-Schrieffer (BEC-BCS) crossover in fermionic Li-6 using Bragg spectroscopy. A smooth transition from molecular to atomic spectra was observed with a clear signature of pairing at and above unitarity. These spectra probe the dynamic and static structure factors of the gas and provide a direct link to two-body correlations. 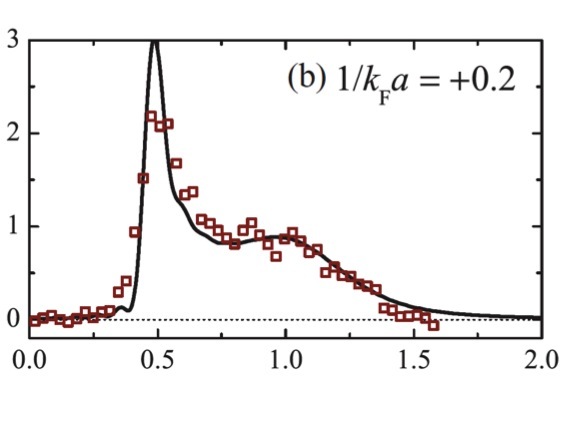 We have characterised these correlations and measured their density dependence across the broad Feshbach resonance at 834 G.
We have measured the binding energies of Li-6 p-wave Feshbach molecules using magneto-association spectroscopy. These allow us to determine the magnetic moment of the molecules, and our values are in good agreement with theoretical predictions. We have also investigated the size of p-wave molecules which we find to be much smaller than s-wave molecules even within a few mG of the Feshbach resonance. 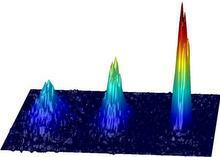 We have produced Bose-Einstein condensates of Li-6 molecules in a low-power crossed optical dipole trap. Our experimental procedures for generating condensates and degenerate Fermi Gases are described in the paper below. More recently we have introduced a 100 W fibre laser to our experiments, now we can produce near pure molecular condensates containing over 200,000 molecules.